One of the things that’s irked me about Facebook’s fan page setup is that fact that you couldn’t change the image that went along with a link you posted. You could page through multiple choices, but you couldn’t outright change it. This was especially annoying when you didn’t own the site you were linking to. Sometimes sites had bad images, sometimes no image that would show in the item preview. 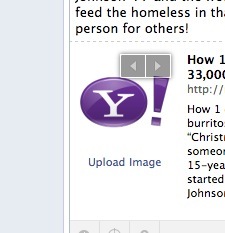 I don’t have hard numbers, but I believe that people click less when there’s a misleading or missing photo. Here’s an example of it done with no image. No offense to WPTuts+, of course. That’s pretty interesting. Now I can make sure a better icon appears there. The social media manager part of me thinks that’s awfully useful, but the brand manager in me slightly worries that there isn’t much stopping people from posting links to my stories and websites with images that are misleading and/or don’t follow my brand standards attached to them.